I have just asked around the office for confirmation of the five stages of grief: the consensus seems to be - denial- bargaining - anger - depression- acceptance. As of this morning, I am midway between anger and depression - with anger definitly in front, especailly, if I re-traumatise myself by looking at this image. I love this image. I have known it for 25 years. It is a core part of my personal intellectual history. I first came across in 1984 in a text in the old Middlesex Polytechnic Library while writing an essay on Macaulay, the 19th century essayist, historian, and politician..
For some reason I was entranced by 'young Tom' There was his parents for starters - he was the son of Zachary Macaulay, one of the Clapham Saints, which included Wilberforce, all of whom were prominent in the movement for the abolition of the slave trade. As for Thomas, for years I passed his childhood home on my way home from Clapham Common tube. The more I learned about him, the more I loved his reported cleverness - his industry - and his determination to use his intellect, not just to think, but to think to a purpose. I even enjoyed reading his essays - found the history of the Edinburgh Review and its famous rival the Quarterly Review, an equal fascination. 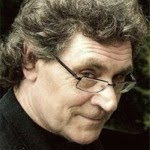 Best of all, through Tom Macaulay, I recognised the fellow feeling of the secret autodidact hidden carefully but cheerfully away inside the formal structure of, in my case a degree course as a mature student, and in his, as a member of the political and intellectual elite of his day. That this political and intellectual elite was at the time, either Whig or Tory goes without saying. If on the Whig faction, you didn't get anywhere unless you turned up to the famous soirees of Lady Holland, at Holland House, set amidst its own extensive grounds in north west London, which 21st century Londoners know as Holland Park. Macaulay, though by no means a social high flyer, was by all accounts a star, regularly earning his supper and a re-invite In the process, not only did he gain access to the inner circle, he had a standing invite to use the famous Holland House library any time he liked. Like most things, the Holland House elite didn't last - these days Lady Holland is remembered, if at all, as the woman who introduced the dahlia to Britain. But the legend of the library did endure, as did the house itself, surviving into the 20th century, and finally coming to grief in a 10 hour air raid in September, 1940. All of which is context to the image above. 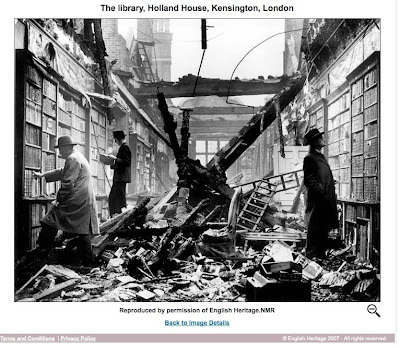 This is the Holland House library the day after the air-raid. 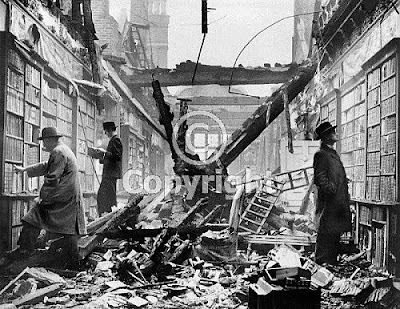 The roof is down - the devastation is everywhere - but by some miracle the books are still intact on the shelves, and the accompanying three gentleman browsing at their leisure, one of the all time images of British endurance during the 2nd World War. Apart from my own personal history, this is a story that needs retelling. But now, English Heritage think they own this image, and all the layers it contains. Moreover, they think they can control its future use by a labyrinth of charges ranging from the creative to the editorial to the personal - whatever these might mean. And last but by no means least - they think they have the right to mutilate it by sticking a copyright sign on it. As I note in my intro, I am beside myself - this image is part of my intellectual history - my story - my heritage - and they are claiming ownership of all three. At a personal level, it is beyond conscience. On a public institutional level, another tragic example of the memory/heritage sector mad with avarice, and blind to their future. Shame on them! Turns out - and thanks to @mdgreaney - there is a non stamped version of the image here, on English Heritage Viewfinder. They still think they own a public domain work. 5.1 All content on the Site including but not limited to images, text, software and graphics is protected by copyright. We, or our licensors, own copyright and/or database rights in the selection, coordination, arrangement and enhancement of such content, as well as in the original content. Photographs are the copyright works of those indicated next to each image. English Heritage and the English Heritage logo are trademarks of English Heritage. 5.3 You may download material from the Site for your own personal, non-commercial use only. Downloaded material may not be re-copied or shared with any third party. However, if you are a teacher in primary, secondary or tertiary education, you may make copies of downloaded material for your reasonable teaching purposes within the classroom only. Any other reproduction or extraction requires our written permission and a fee may be charged. Photographic prints of most of the images on the Site may be purchased from English Heritage's National Monuments Record for private and research use. For further information please contact us using the contact details at paragraph 9 below.